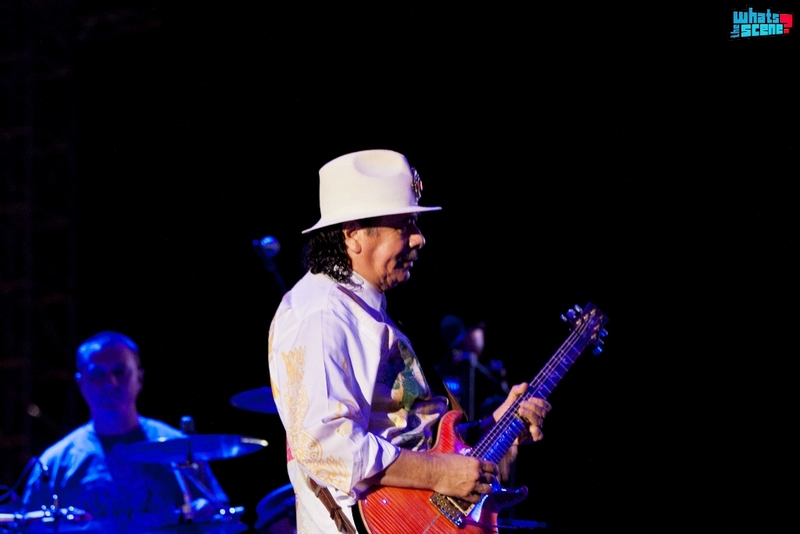 Santana live at Bharatiya E-City | WhatsTheScene? 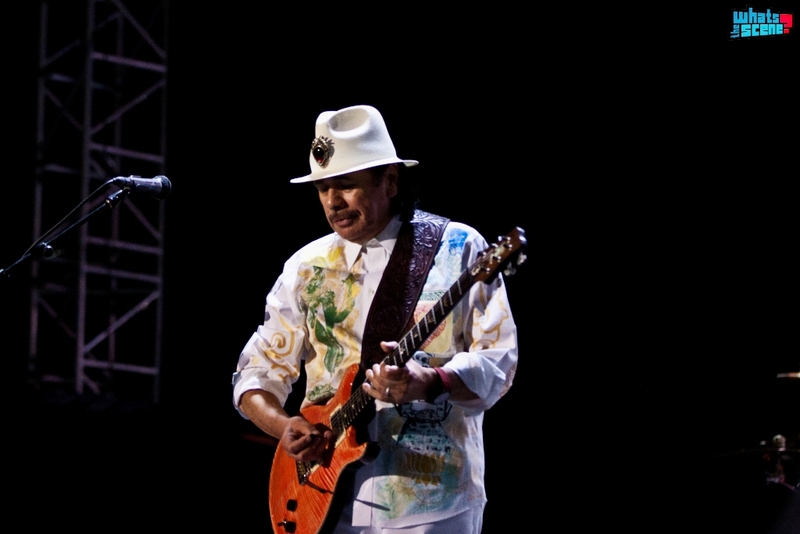 Among the sudden glut of international acts that decided to tour India, Santana was probably the biggest in terms of album sales and radio play received. From playing at Woodstock to having a career revival in the late 90’s, Santana has managed to keep their music fresh for most part at least (lets ignore the Chad Kroeger collaboration, shall we?) While his latest outings have been criticized in some circles, there’s no denying that the man is an absolute legend. Thus a jaunt to the venue at Thanisandra, my second in two weeks, would have to be undertaken even if it meant cutting work early. Most Bangalore concert-goers are accustomed to a 8 o’clock start so when the emcee welcomed the “God of guitar” on stage, it was bit of a surprise to see Carlos Santana, flanked by the ten (!) other members of the band, play the opening bars of ‘Yaleo’ at 7pm. 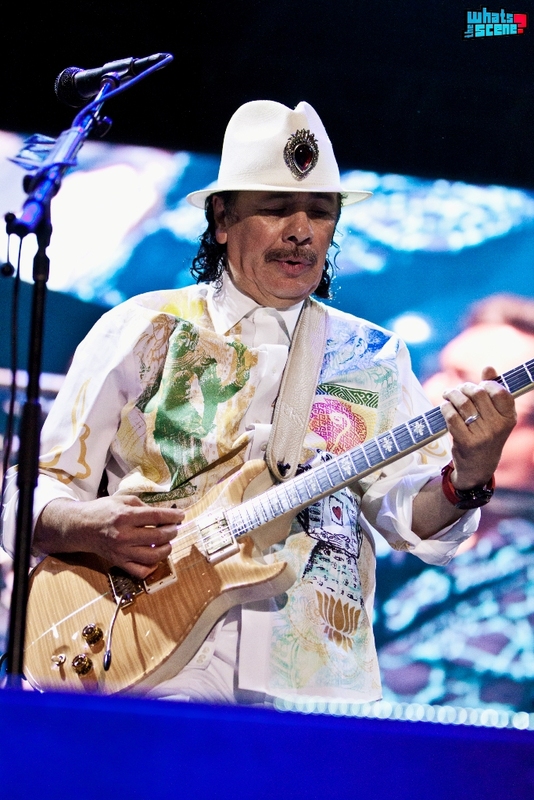 Clad in his trademark hat and a white jacket with “PEACE” emblazoned on the back, he walked out on stage holding his weapon of choice – the PRS Santana Signature. The acoustics were as good as they could possibly have been, with the sound of each instrument coming in crisply. 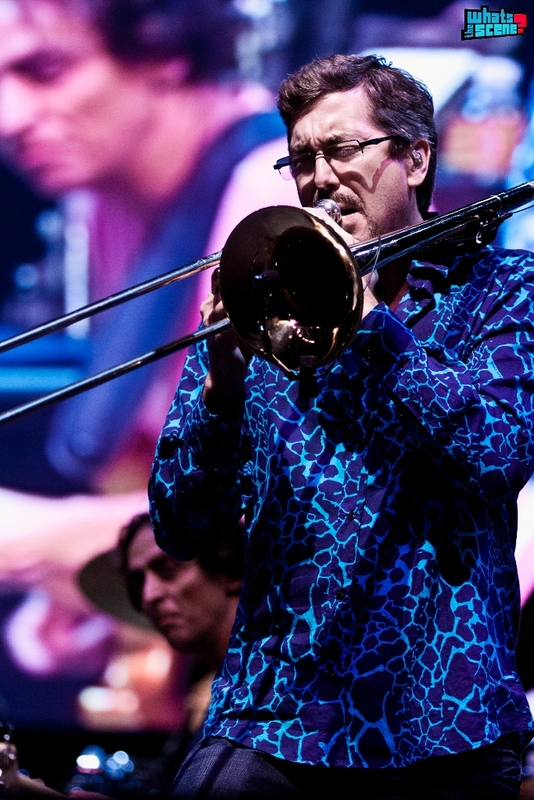 Instantly groovy and featuring Latin rhythms, Santana played ‘Love is You’ which contained a quite excellent trombone bit from Jeff Cressman, who went quite blue in the face after the energetic solo. The backdrop had a large, distracting screen which alternated between montages of Santana’s older shows and the concert we were witnessing. Just as the track ended, the very familiar intro featuring the sounds of the Hammond organ of ‘Black Magic Woman’ filtered through, as the yuppie crowd roared and whistled in approval. 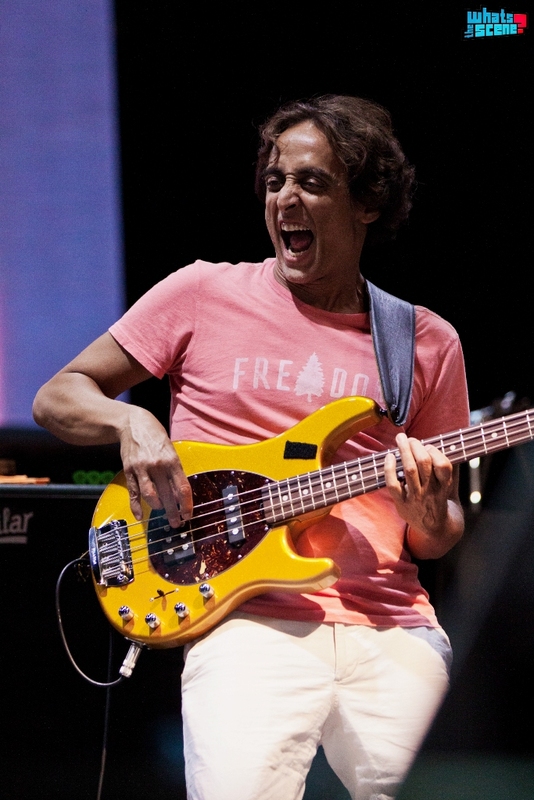 The tone of the song shifted seamlessly to the booming basslines of ‘Gypsy Queen’ where the percussionists really shone through and Carlos S. made a liberal use of the wah-wah pedal. The musicians then went off-beat, playing a psychedelic outro before converging on the same note that ended the song and perfectly segued into ‘Oye Como Va’. Originally by legendary Latin jazz musician Tito Puente, Santana has made this up-tempo version his own, with an infusion of some blues-influenced guitar solos. The giant screen showed vignettes and snapshots from Bangalore-life as recognizable landmarks like Vidhana Soudha and M.G. Road flashed across the backdrop. The dynamism between all the seasoned musicians on stage was astounding as none of them seemed to miss a note. The two vocalists also played on Güiros, to add to the congas, drums and timbales, giving the song an added spiciness. The minute an acoustic guitar was brought onto the stage, we all knew what the next song would be. 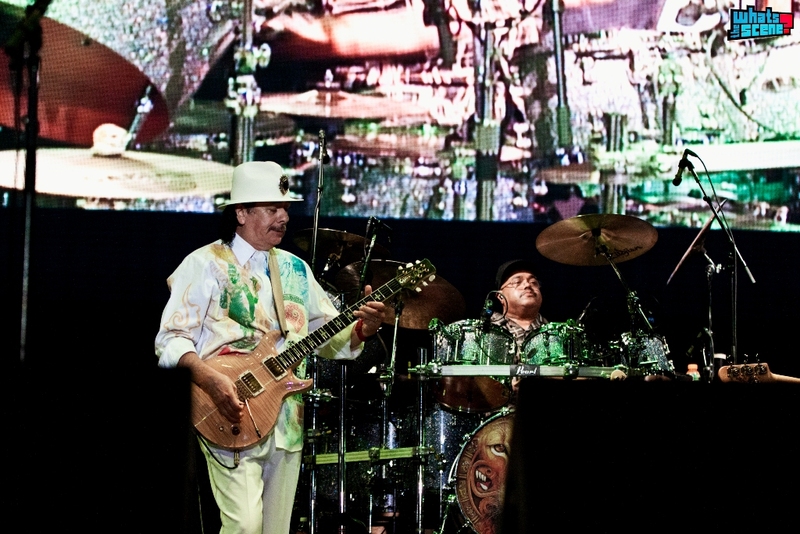 Santana’s smash-hit from their best-selling album – Supernatural, ‘Maria Maria.’ Starting with flamenco-influenced acoustic intro and moving to the bluesy electric licks, Carlos Santana’s guitar blended perfectly with the two-part vocals as the audience screamed the chorus along with the band. He then introduced his wife Cindy Blackman, a jazz drummer as she replaced the legendary Dennis Chambers for a rousing performance of ‘Corazon Espinado’ followed by a rather lengthy and tedious drum jam. The drum solo by Blackman unfortunately meant we wouldn’t get to see a drum solo by Chambers as he was content just providing the solid backbone to the frenetic sounds of the band. It was overwhelming to see eleven musicians together on stage, with each getting ample time to shine. There were times during the concert when I wasn’t sure which part of the stage I should focus on! The pick of their setlist though was ‘Jingo’, full of Afro rhythms, 4-part vocal harmonies and subtle nods to Osibisa and Soul Makossa (which Michael Jackson sampled in ‘Wanna Be Startin Something’). 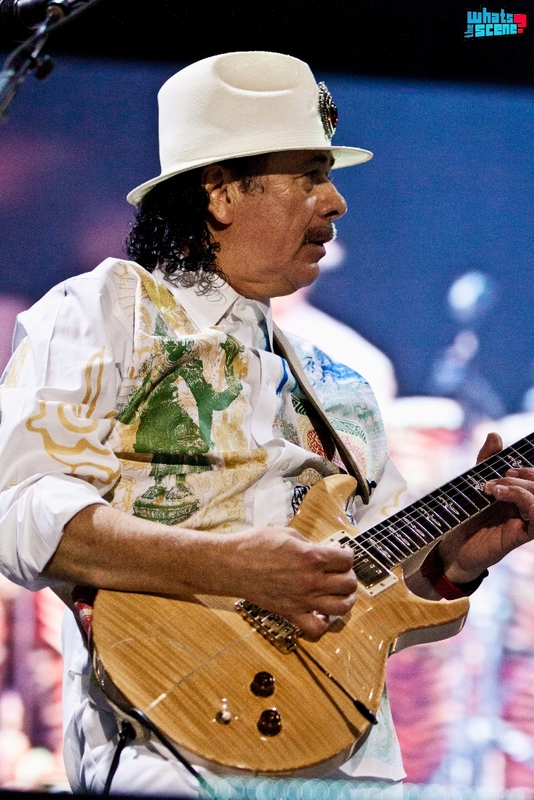 They slowed things down with the instrumental piece ‘Samba Pa Ti‘, spotlight shining solely on Carlos Santana who has this ability to start a note a fraction of a second early and then bend the note for eternity. The feel he displayed, especially on his solos was phenomenal. The crowd, quiet to begin with, was now all warmed up. People moved and hips swayed as the band moved from the classic ‘No one to Depend On’ to the stompin’ ‘Everybody’s Everything’. It was incredible when all the musicians played a repetitive riff for a few bars and then one of them would go on a tangential solo within the boundaries of that very riff. 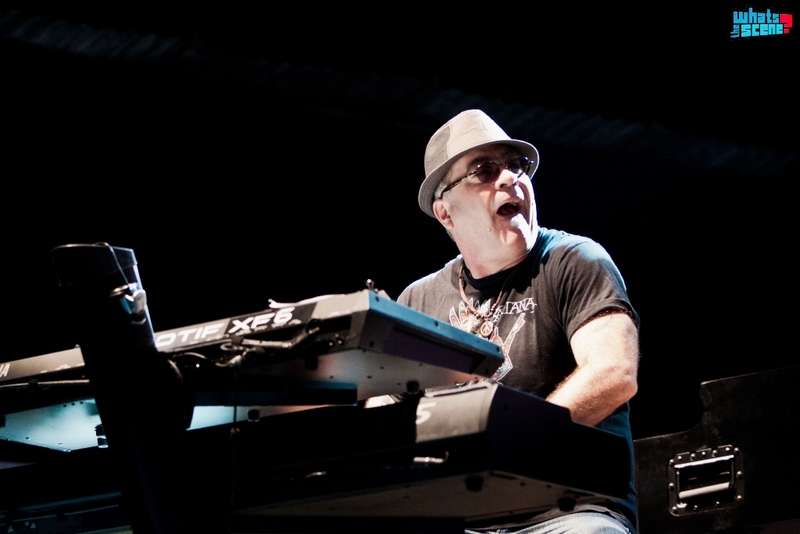 To produce such a cohesive sound takes immense skill, practice and a great sound engineer too !. After an ‘Evil Ways/Love Supreme’ medley where Carlos delivered a rather …erm… lengthy monologue about peace, love and light, they closed out their long set with ‘Smooth’. 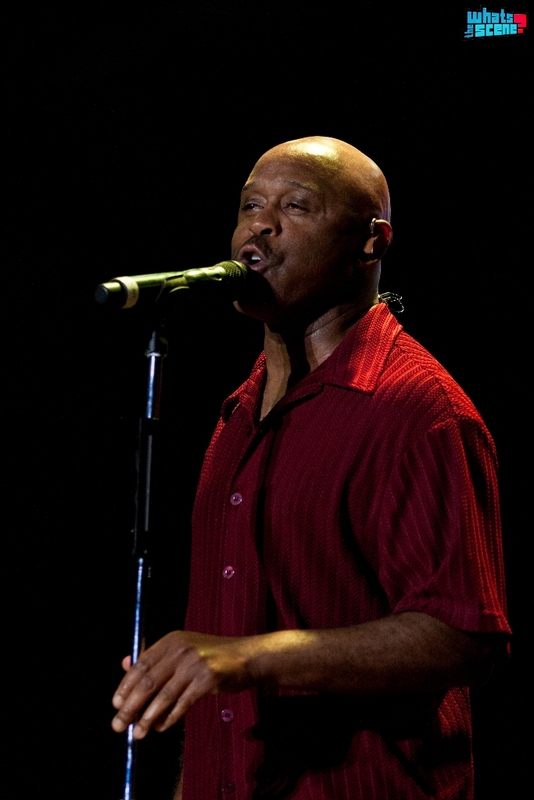 Although vocalists Tony Lindsay and Andy Vargas couldn’t quite do justice to Rob Thomas’s original, every single person in the crowd sang along to drown the band out. Good music, in my book at least, is defined as something that will move you. Move you to dance, move you to cry, move you to headbang. Listening to Santana play live for two hours did just that. The crowd was moved to dance, sing along and feel the emotion behind songs like ‘Europa’ and ‘Samba Pa Ti’. “I don’t like a guitar to sound like a guitar. I don’t want to hear notes. I want it to sound like life.” was what Carlos said in an interview before the concert and he showed us just what he meant. The background screen displayed footage from the iconic Woodstock concert in ‘69 just as Santana walked back onto stage performing ‘Soul Sacrifice’. Appropriately, they finished their encore with ‘Into the Night’and ‘Toussai L’Overture’. Two hours and fifteen minutes of non-stop groove, flamenco, Latin rhythms, Afro beats and blues-inspired solos came to an end. 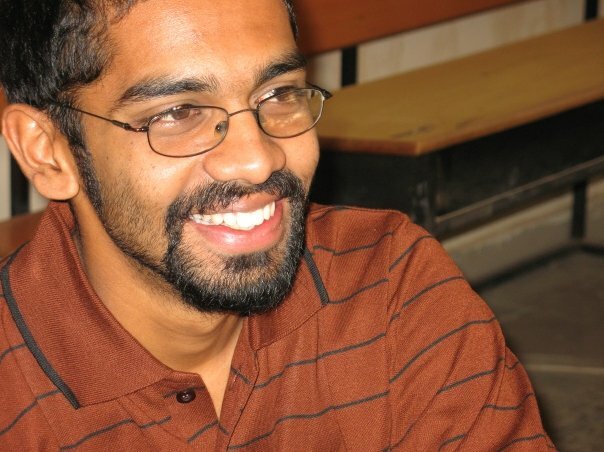 Everyone wore wide grins on their faces and headed to their swanky cars, looking completely satisfied. A day before the concert, I had attended the Santana press conference. I’d carried with me a cassette from the 80’s – a ‘Santana Greatest Hits’ tape that my dad used to play on loop when I was a kid, in the vain hope of getting it autographed by the legend himself. Alas, that didn’t happen since he was whisked away by his entourage immediately after the brief conference. Crestfallen, I had hoped that the concert experience would make up for this and it did in more ways than I could have wished for.